Each year the crisp air and crunch of leaves beneath my toes brings with it a longing to be home. A longing to be with loved ones and contribute to the separate narratives that each of us are writing with our lives, no matter how far apart we are for most of the year. Knowing my way around the kitchen (I am a food blogger after all) means I am able to help with the details: whipping up an impromptu gravy, baking rolls from scratch, or making sure the stuffing comes out of the oven on time. But most importantly, I can make dessert. It’s a scientific fact that you can never have too many desserts around the holidays. One day you’re looking at that mound of pie and cookies asking yourself how any one family can eat such a grotesque amount of sweets. The next day it’s diminished to crumbs. 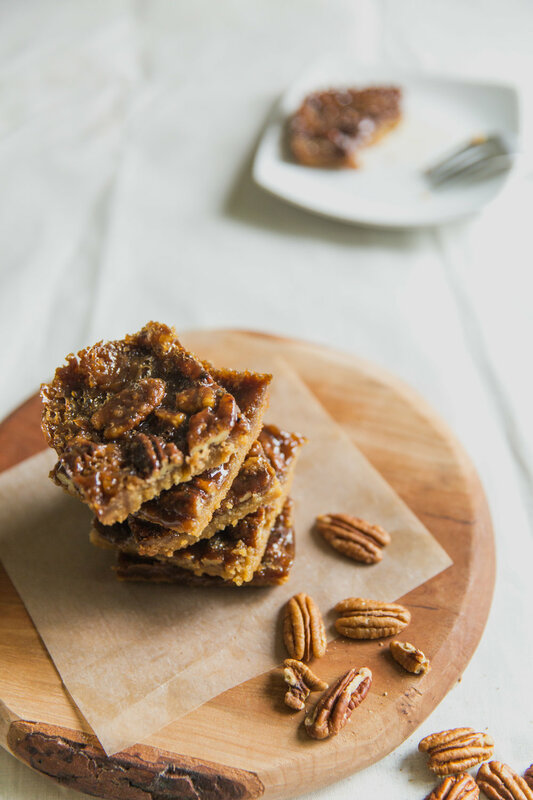 So if you’re grasping at straws at what to bring to your uncles shindig, or the last minute gathering your new friend invited you to, these boozy pecan bars are the ticket. This recipe combines an ooey, gooey, crunchy, nutty filling on top of a not too sweet brown sugar base. The best part is you don’t have to make a pie crust and can avoid those disappointing store bought crusts all together. 2. Mix 2 cups of flour, 1 cup of brown sugar, and 1/2 cup melted butter together in a bowl. The mixture should be crumbly but hold loosely together when pressed. 3. Pour mixture into 9x13 baking dish and press into bottom of the pan. The bottom of a measuring cup works great for this! 1. Combine 1 cup butter, 3/4 cup brown sugar and 1/4 cup of bourbon in a medium saucepan over medium heat until bubbly. 2. Off heat, stir in salt, vanilla and toasted pecan halves. 3. Pour filling into pan with crust and bake at 350 for 25-30 minutes. 4. Remove from heat and let cool 1 hour before serving.